The question about pregnancy seems like a natural follow-on after marriage has settled. As I talk with younger and older Christian female friends, I realise how varied the fears and frustrations are. One of my friends told to me how annoyed she was when older women asked her about the prospect of children—but never asked about her spiritual growth as a Christian. Other friends experienced a miscarriage and kept it a secret from the wider church community. Several friends have been moving in and out of the waiting game, and some have given up the prospect altogether. As I talk with younger and older Christian female friends, I realise how varied the fears and frustrations about pregnancy are. One of the main ideas that Matthew Arbo discusses is how the different narratives we tell ourselves about the Christian life shape our expectations surrounding experiences such as pregnancy. Sometimes, for example, people speak and act as if godly womanhood and manhood corresponds to the number of children you have. Nurturing children is a noble responsibility, but do we really think a godly Christian life is incomplete without children? Arbo affirms that children are a gift, not an entitlement. His answer to the despair of the childless is that “the Creator and Redeemer of life has not forsaken the infertile but has instead given them a slightly different way of being family, and thus of participating in the life and mission of God” (p.20). To illustrate this point, Arbo helpfully presents case studies of biblical characters such as Abram and Sarai, Elkanah and Hannah and evaluates how the story of their infertility appears in the light of the gospel. Arbo doesn’t just leave it at biblical examples, however. He weaves in the stories of his friends discovering their inability to conceive; exploring their experiences at different stages of their journey. These contemporary stories also deserve to be told because the truths of the gospel are further affirmed in the lived experiences of those around us. I particularly appreciated the extended interview with Patrick and Jennifer Arbo, at the end of the book, about the emotional process of discovering their infertility. It’s important to know what this book (like any other book) seeks to address, and what it doesn’t. 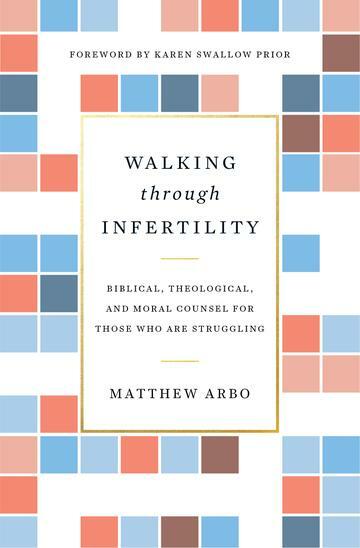 Arbo says that his purpose is “to address biblical, theological, and moral questions surrounding infertility.” His aim is to “instruct and inspire the church, especially those couples with personal experience with infertility” (p.19). After reading the interview section, I was inspired to think about how churches could welcome these sorts of stories in their gatherings. Even so, Arbo’s illustration of how childless couples can participate in the life and mission of God seemed limited. We still need further wisdom on how we can support and encourage our brothers and sisters to be Christ’s disciples, in their different situations, and stages of grief. A significant portion of the book is spent dealing with infertility treatments and reproductive technologies. In the chapter, “A Moral Appraisal of Infertility Treatment” Arbo cautions couples “not to allow the desire for a biological child to supersede all other biblical, theological, or ethical considerations” (p.93). But his explanation and subsequent warnings should be weighed carefully. Couples experiencing infertility should seek the advice of someone who is a trusted specialist in the field. For Australian readers, the careful consideration and weighing of Arbo’s advice is even more significant as legislation and procedures will vary from country to country. So how should one use this book? For Christians in general, and pastors specifically, engaging with the concepts in this book will be helpful in developing the skills to be a caring brother or sister to friends in their grief, loss, and unmet expectations. Personally, I’m thankful to come upon this conversation in my time of premarital counselling: I think this book would be a good primer and discussion point for many couples to read before and/or during the early years of marriage. I’ve been convinced that we should acknowledge the pain and suffering of our brothers and sisters, and seek to be people of understanding and comfort in this area. Individuals think about pregnancy with their own assumptions and longings, and it may prevent a lot of heartache if we can work through them together, in reflection and prayer to God.